Your email is already registered in our system. Please sign in. You don’t have any items in your shopping cart. How does the Vita Energy Smart Shake work? Vita Energy is equally effective in a balanced diet aimed at either weight gain or weight loss. By taking the cocktails according to a specific schedule, you'll quickly achieve the best results. Drink the shake with breakfast and at bedtime. If you wish to gain weight, you should also take it after dinner. Strawberries awaken memories of spring and summer. It is a substance obtained in the course of complex chemical reactions. It improves and boosts your metabolism. A highly purified type of protein which has regenerative and stimulating properties. 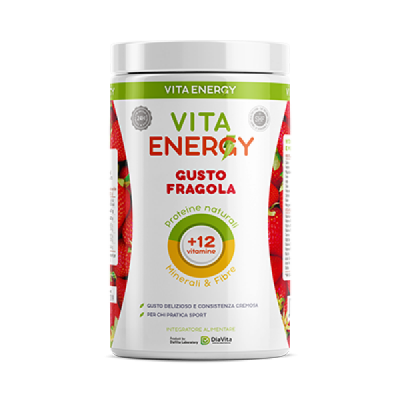 Vita Energy provides you high-quality proteins, minerals, vitamins and fiber. The combination of carefully selected active substances creates a synergistic effect. Getting healthy is Delicious, Fast and Safe. Vita Energy shake can be used in a healthy diet and fully replace one or two meals a day. In addition to high-quality proteins our meal shakes contain all the vitamins, minerals, fibers and essential amino acids according to the statutory European standards. * Reference daily intake for an average adult (8400 kJ/2000 kcal per day). Potassium iodide, Sodium hydrogen selenite, Copper (II) gluconate, Manganese sulfate). or milk*. For thicker, creamier shakes, use a blender and mix for 30-40 seconds. As a meal replacement, men and women should take 2 servings daily. WARNINGS: Food supplements do not replace a balanced diet and healthy lifestyle. Do not exceed the recommended dosage. Keep out of the reach of children. Storage conditions: Store the jar with lid tightly closed at 5-25°C (41-77°F). Keep away from direct heat, moisture and sunlight. Do not store for more than 6 months after opening. * These statements have not been evaluated by the authorised food and drug organisations. These products are not intended to diagnose, treat, cure, or prevent any disease. ** Results are not necessarily typical. Individual results will vary. Vita Energy shakes can help slimming or weight control only as part of a calorie-controlled diet. These web analytics cookies are used to collect information about how visitors use our site. We use the information to compile reports and to help us improve the site. The cookies collect information in an anonymous form, including the number of visitors to the site, where visitors have come to the site from and the pages they visited. For different shops different baskets, delivery countries and availability of products.